Emmie Jeter passed away on February 2, 2019 at the age of 91 in Las Cruces, New Mexico. She was living at Hacienda Senior, LLC a 24-hour care facility in Las Cruces, NM. Emmie was born July 7, 1927 in Fredericksburg, Texas to Emil and Emma Dietrich. She was preceded in death by her sisters: Meta Sultemeier, Eleanor Jung, Ruby Key and Alice Spaeth. Emmie is survived by three children: Connie Gomez of Las Cruces, NM; Kathy Black and her husband Ardell Black of Lubbock, TX; and Dennis Kelch of Amarillo, TX. Her step children are Larry Jeter of Blanco, NM; LaDene Whitaker of Olney, TX; and Ralph Jeter of Olney, TX. They were preceded in death by their brother Lawton Jeter. She was blessed with her grandchildren: John Gomez of Las Cruces, NM; LeAnne Gomez of Albuquerque, NM; and Myka Kelch of Wellington, TX. Emmie was blessed with a total of 16 grandchildren and 26 great grandchildren. by her husband, Harold Jeter of Lovington, NM. She graduated from Texas Lutheran College in Sequin, TX and received a degree in General Studies. In her previous employments she was an accountant, secretary, and bus agent for Grey Hound Bus Lines in Lovington, NM. She was employed by Grey Hound for about 45 years. 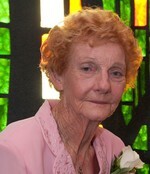 Emmie was a member of Our Savior Lutheran Church in Lovington for many years. Emmie also volunteered at the Veteran's Hall for Bingo. After moving to Las Cruces, NM in April of 2011, she became a member of Mission Lutheran Church. Emmie loved to cook and enjoyed canning, sewing, and gardening. She was well known for her pies, cinnamon rolls, bread and butter pickles and apricot jam. We have fond memories of her reading the bible and drinking coffee early every morning. A memorial service will be held in Las Cruces, NM at 6:00 pm, February 15, 2019 at Mission Lutheran Church, 2752 N. Roadrunner Parkway. A reception will follow the service at the Mission Lutheran School. If you wish to make a donation, please do this with the Alzheimer's Association. To send flowers to the family of Emmie M Jeter, please visit our Heartfelt Sympathies Store. Proudly Serving the Communities of Proudly serving Las Cruces, Hatch, Anthony, Alamogordo, Deming,and surrounding areas.